It starts with you knowing what you have in your own country. Here, state tourism minister Godfrey Kiwanda feeds a giraffe at the Uganda Wildlife Education Centre (UWEC) in Entebbe earlier this month. KAMPALA - Starting this September, the tourism ministry will select a few Ugandans to tour different tourist attractions in the country to learn more about Ugandan sites to be in position to market tourism abroad. State minister for tourism Godfrey Kiwanda said this while launching the Rolex Festival at Uganda Museum. He said many Ugandans do not know the tourist attractions in their own country, which makes it difficult to promote tourism. Kiwanda said a select group of citizens will be given an opportunity to move around with the minister for tourism and later they will be ambassadors of tourism. 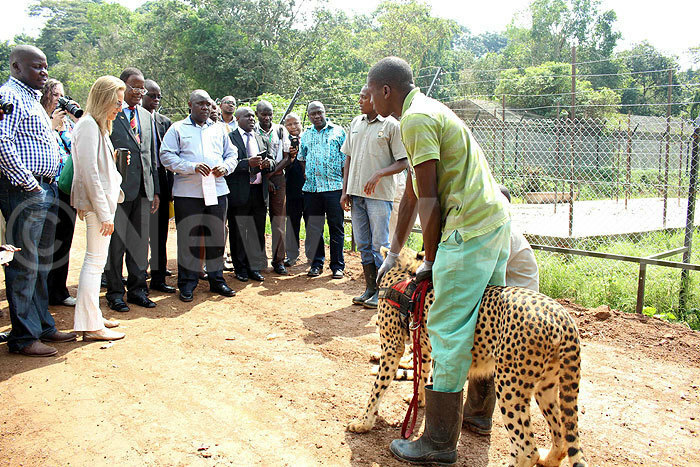 Minister Kiwanda, visits Charles Hamkungu, an elephant at UWEC. Looking on are James Musinguzi (left) and Bonifance Byamukama, the president Uganda Tourist Association (right).